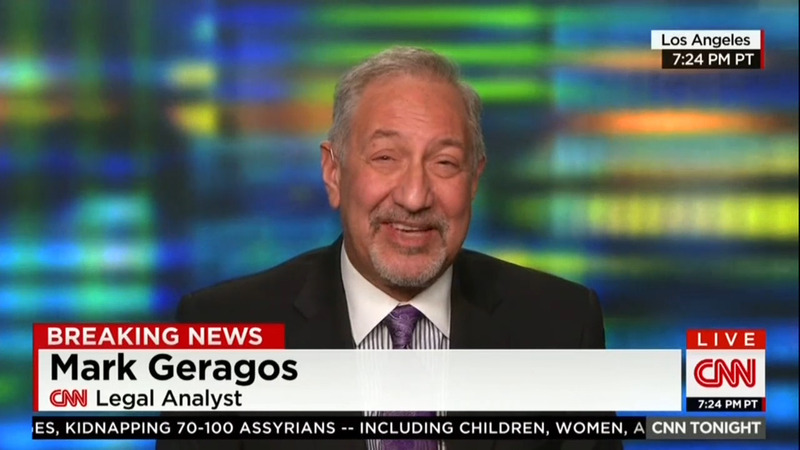 "Mark Geragos is no longer CNN contributor." Despite this acknowledgment, the network has yet to mention Gergaos’s name on-air his role in the SDNY case against Avenatti (and not the one in Los Angeles). In the span of less than a week, ISIS has been defeated, the President and his team have been cleared by Special Counsel Robert Mueller on collusion with Russia, and liberal media darling Michael Avenatti has been arrested in regards to two federal cases (in Los Angeles and New York) concerning allegations of extortion, fraud, loans, and tax filings. And because of all that, the liberal media are stuck riding the strugglebus. But as it turns out, the last story got even better and more incredible on Monday afternoon. CNN legal analyst Mark Geragos is alleged to have been one of Avenatti’s co-conspirators in charges brought by the U.S. Attorney’s Office in the Southern District of New York as part of what the Justice Department has stated was an attempt to extort Nike. The allegations related to Nike arose out of Mr. Avenatti’s representation of a client identified in the complaint as the coach of an amateur men’s basketball program in California, which prosecutors said had a sponsorship agreement with Nike. The co-conspirator in that matter is attorney Mark Geragos, two people familiar with the matter said. Mr. Geragos couldn’t immediately be reached for comment. Representatives for Boies Schiller Flexner LLP, a New York law firm that serves as outside counsel for Nike, didn’t immediately respond to requests for comment.